Cruise to British Columbia's most remote and spectacular West Coast locations while enjoying the luxury accommodations and gourmet cuisine aboard our 54-foot motor yacht, Great Bear II. Based out of Vancouver, BC, we offer coastal cruises, ocean adventures, custom charters and wilderness tours by boat along Canada's incredible Pacific Coast. 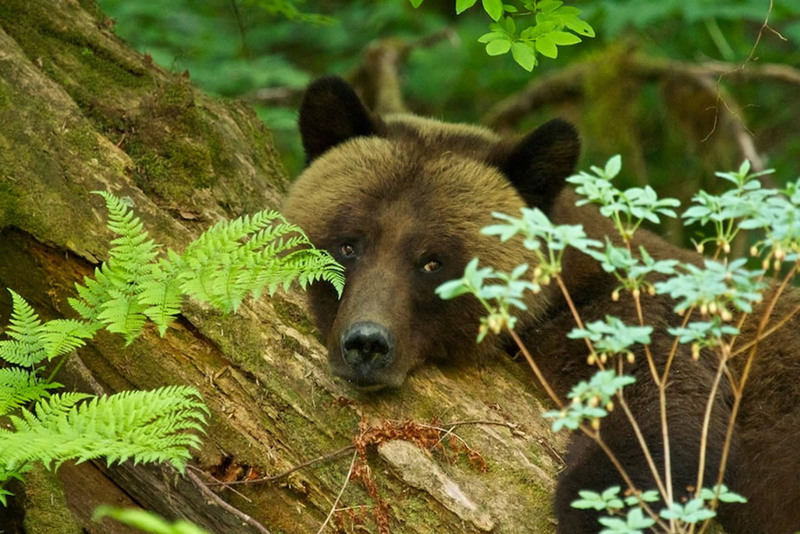 Enjoy unparalleled wildlife viewing and whale watching, experience BC's First Nations culture, walk beneath canopies of cedar, spruce and hemlock, and along the velvety green estuaries of the Great Bear Rainforest. Relaxing in the pristine natural hot springs on the polished granite shores of our anchorage, you may hear the blow of a Humpback whale as it surfaces, the distant howl of a wolf, or the serenade of songbirds above you. If a little less wilderness and a bit slower pace is what you're looking forward to, our Captain and crew know just the spots to take you to. Beachcomb white sandy beaches edged in turquoise water, enjoy a picnic lunch, and later on watch the sun set while you enjoy a glass of wine and appetizers. Whether you join us for one of our scheduled departures... or design your own Custom (Private) Charters Trip... we look forward to welcoming you aboard for the trip of a lifetime. Scheduled departures for 2019 for you to join, or to book private (custom) charters on, include departures on British Columbia's central and north coasts, and during the off season on the south coast. All of our trips are designed to coincide with nature's great events and the most reliable weather during which to enjoy them. We have no set itineraries. Instead we prefer to enjoy each day based on tides, weather, and what we have seen the day before... just as the wildlife does along this coast. Join us in May or June for one of our 6, 8 or 9 day trips into the heart of the Great Bear Rainforest, Inlets of the Grizzly, the Great Bear Rainforest in Spring. 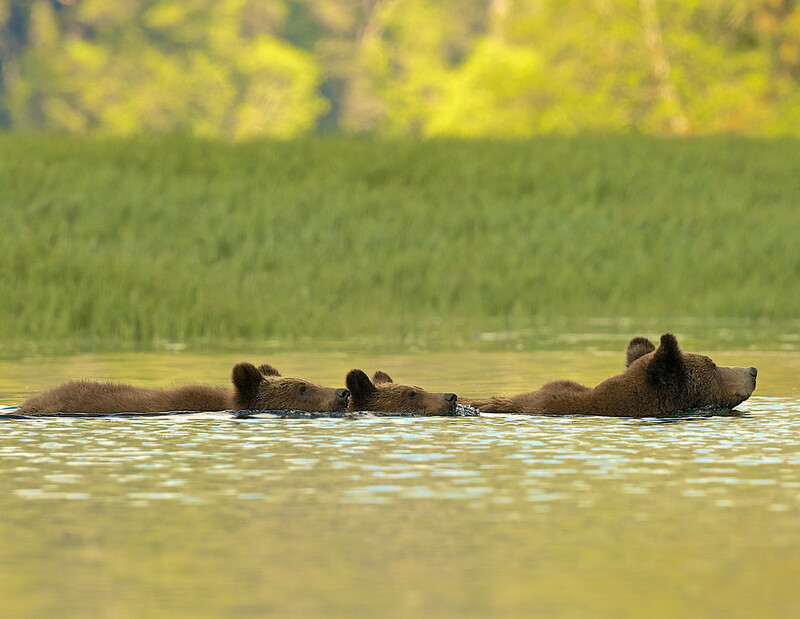 Bears just out of hibernation, some with cubs in tow, come to the lush river estuaries at the heads of these inlets to feast primarily on the protein rich sedge grasses, the roots of plants such as skunk cabbage, and the earlier Salmon berries. The powerful landscapes of immeasurable beauty are in part, the focus of these trips, and also provide the backdrops for some of the best wildlife viewing, bird watching and photography in Canada! June is spring on BC's central coast. The rugged mountain peaks of the Coastal Range are still draped in snow. The long, narrow inlets off the Inside Passage are defined by the polished granite walls that rise thousands of feet out of the sea and at this time of year are laced with waterfalls that seem to fall from the sky. The velvety green river estuaries at the head of these inlets are carpeted in wildflowers and teeming with new life, including the bears, wolves, and birds that have come here to raise their young. 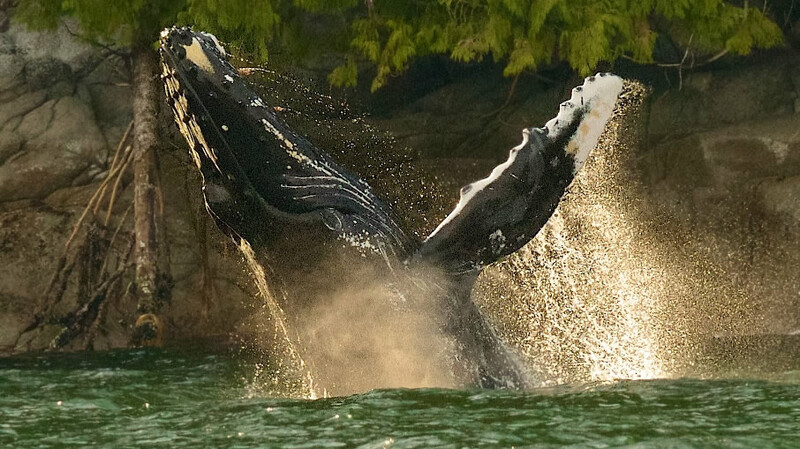 Along the passageways that we will travel are critical feeding habitats for Humpback whales, making this part of the coast, one of the best for seeing Humpback Whales. At this time of year we may also see Resident and Transient Orca, dolphins, porpoises, Stellar Sea Lions, Seals, and even Elephant seals. 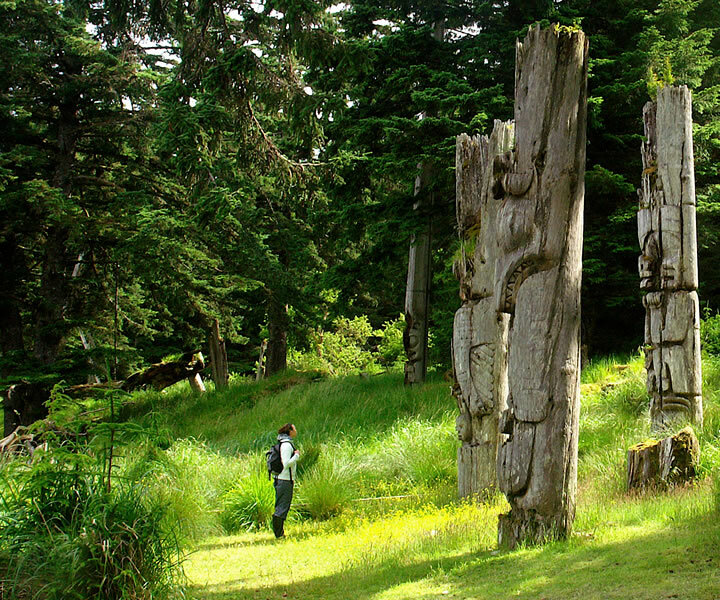 Join us in Haida Gwaii (formerly the Queen Charlotte Islands) to explore Gwaii Haanas National Park Reserve and Haida Heritage Site. 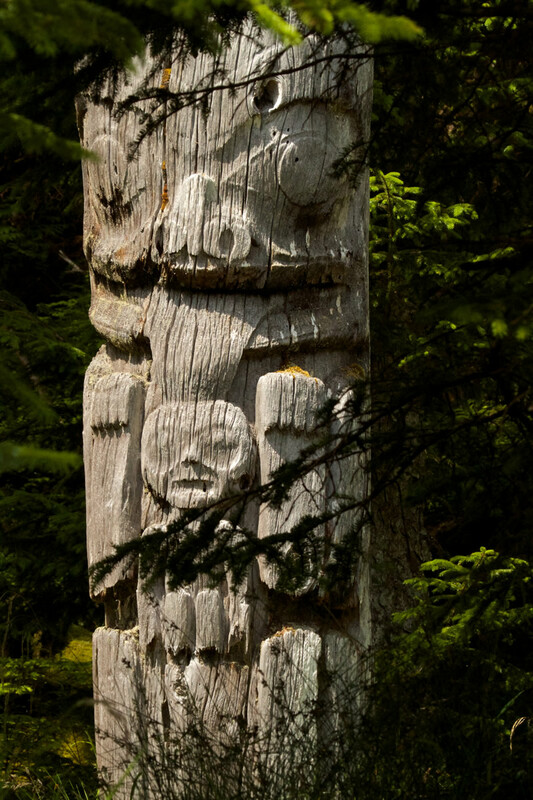 Our trips there in July and early August will focus on the powerful Haida culture and the awe-inspiring biodiversity of this archipelago. Whether standing beneath the mortuary poles in Sgang Gwaay or watching the many seabirds including Tufted Puffins, or witnessing the power and grace of the many whales, these trips are definitely the trip of a lifetime! While you can experience B.C. 's best whale watching on all of our trips, we are offering a 5-day trip in early August which is focused on whale watching. While not widely advertised as a hot spot for whale watching, this part of the world is home to Humpback whales, both Resident and Transient Orca, Fin whales (the 2nd largest cetaceans on earth), Dalls Porpoises, and Pacific White Sided Dolphins. On these trips our guests also enjoy extraordinary opportunities for wildlife viewing, bird watching and intertidal exploration, walk remote white sandy beaches and witness our West Coast's spectacular sunsets! See our Whale Watching page for more information and photos! 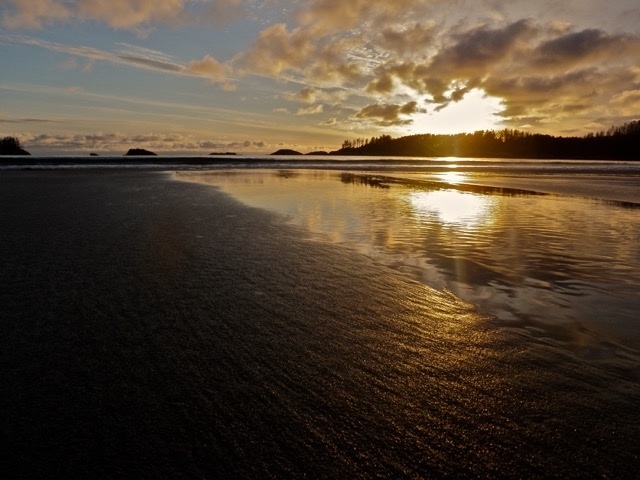 Join us in Prince Rupert on August 7, 2019 for the trip of a lifetime, along the outer islands of B.C. 's Inside Passage. This is late summer on B.C. 's north and central coast. Whales breaching and lunge feeding.. the beginning of salmon returning to the streams and rivers to spawn.. wildlife beginning to switch from eating berries to fishing for salmon... long stretches of pristine, white, sandy beaches where the only tracks aside from your own may be those of a wolf... and the spectacular sunsets of Canada's west coast. In late August and September, wild Pacific salmon begin to return to the creeks and rivers of their birth to spawn and complete their life cycle. 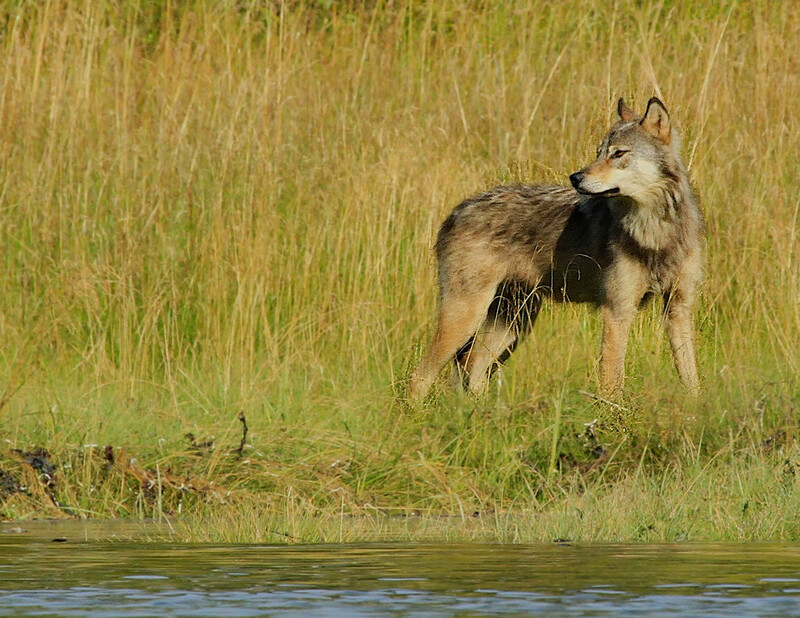 The returning salmon are like a dinner bell to bears, wolves, wolverines and many species of birds. 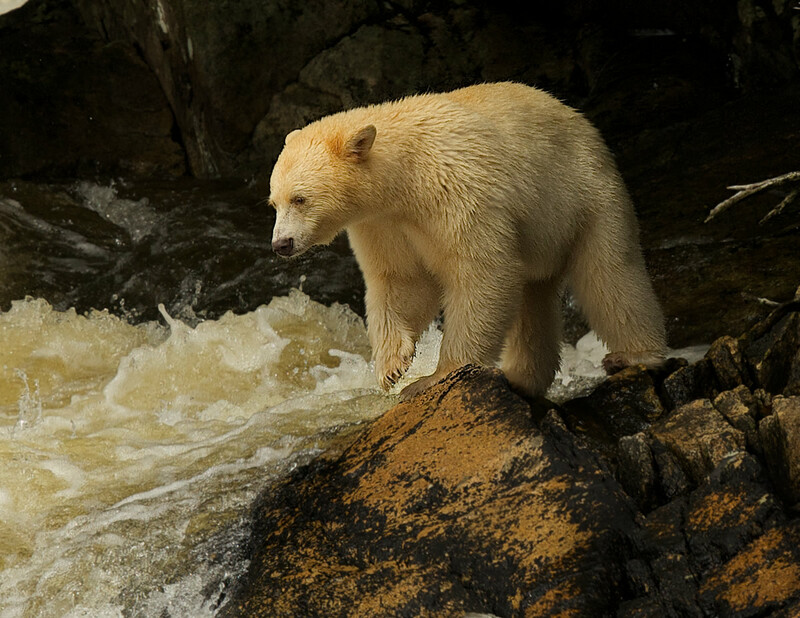 Join us in August and September amidst some of those most soul stirring landscapes on earth for Islands of the Spirit Bear, Waters of the Humpbacks, and experience the Great Bear Rainforest in fall. Whether we're watching Grizzly mothers teaching their cubs to fish... or seeing Black Bears as they pluck jumping salmon from a waterfall... or perhaps see the rare Spirit Bear or Wolf in search of a salmon dinner.. or witness the power of Humpback whales as they fly out of the sea in a full breach...wildlife viewing and whale watching opportunities abound along this part of Canada's west coast. Based on ideas given to us by our returning guests, and areas that we believe will offer new and exciting experiences, we are always designing new trip. We call these new trips "Voyages of Exploration" which are available to any guests that have traveled with us before. Please contact us for more information on our two new Voyages of Exploration in 2019. More new trips are in the works for 2019. Contact us for details. To design your own Private Cruise or trip for your family, group of friends or for photographers or filmmakers, please contact us. While we take up to 5 guests on our scheduled trips, we may, in certain circumstances be able to take 6 guests on our Private (Custom) charters. Whether you'd prefer to explore a part of British Columbia's West Coast at a leisurely pace or fill your holiday with adventure; whether you'd like to design your own custom charters trip or join a scheduled departure, whether you'd like to join us for a few hours, a few days or a week, we'd love to welcome you aboard the Great Bear II! With our Transport Canada certified ship, Captain and crew, we ensure that your time with us is both comfortable and safe. ...where you're never just part of a crowd. Visit our Photo Journals to see photos from our previous trips! Late August through mid-October in the Great Bear Rainforest. Contact us to see what credit cards we accept in addition to Mastercard and Visa. the single biggest threat to the Spirit Bear... and what you can do to help. First class BC wilderness cruises, coastal tours and charters on the West Coast of British Columbia aboard the 54 ft. Great Bear II, out of Vancouver, BC. Copyright © 1998-2019 Ocean Adventures Charter Co. Ltd.